In honor of Judy Moody's younger "bother," the creators of the award-winning series have put themselves in a very Stink-y mood. Every morning, Judy Moody measures Stink and it's always the same: three feet, eight inches tall. Stink feels like even the class newt is growing faster than he is. Then, one day, the ruler reads — can it be? — three feet, seven and three quarters inches! Is Stink shrinking? He tries everything to look like he's growing, but wearing up-and-down stripes and spiking his hair aren't fooling anyone into thinking he's taller. If only he could ask James Madison — Stink's hero, and the shortest person ever to serve as President of the United States. 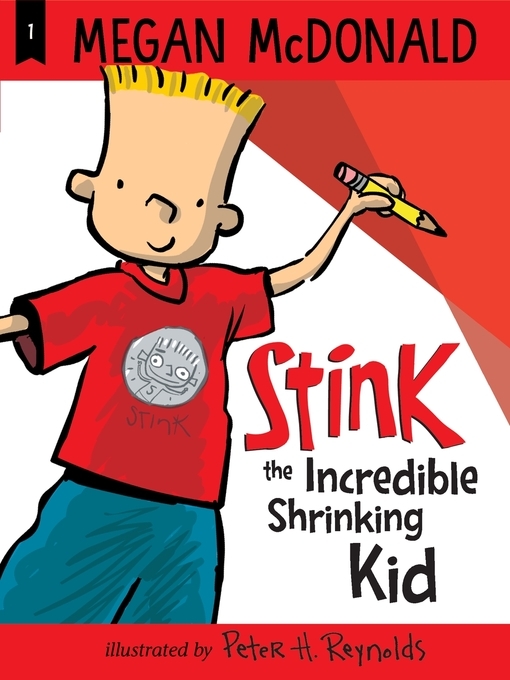 In Stink's first solo adventure, his special style comes through loud and strong — enhanced by a series of comic strips, drawn by Stink himself, which are sprinkled throughout the book. From "The Adventures of Stink in SHRINK MONSTER" to "The Adventures of Stink in NEWT IN SHINING ARMOR," these very funny, homespun sagas reflect the familiar voice of a kid who pictures himself with super powers to deal with the travails of everyday life — including the occasional teasing of a bossy big sister!